This post is for players who have played enough sessions to have the game’s basic rules under their belts. If you’re completely new to role-playing, read this first post in the series. Your DM has certain guidelines and parameters for the world, and house rules to play by. Accept them. Seriously, part of the DM’s job is to figure out these things. Your DM probably has good reasons for using them. That said, you can certainly ask questions about any special rules or restrictions. Your DM wants you to understand them, so if they don’t make sense to you, absolutely ask questions. Just don’t get into arguments about them. If you really dislike a particular restriction, it’s better to find a different group than to get into multiple arguments with this one. Action: Ideally before the campaign begins, ask your DM for any unusual details about the setting, and for a list of house rules. Some players think of the DM as their adversary, as an enemy to be outwitted. In fairness, some DMs think this, too. While your DM is certainly inventing obstacles for your characters, he or she is running a game that he or she thinks will be the most fun for everyone at the table. Don’t look for a way to avoid every plot hook, or to defeat every villain immediately, or to figure out what’s “really going on” and find a way around it. Invent family members, friends, allies, contacts, and other people that your character knows in the world. Tell your DM about them. These will create allies that your DM can bring into the game to help you. Don’t worry about whether your DM will use them against you or not (again, don’t play against your DM). Action: Create one family member, one knowledgeable friend to whom your character can go for information, and one influential acquaintance. Write down their names, classes, races, needs, fears, specific professions (guard, lord, dock worker, etc. ), and physical locations in the world. Send them to the DM and ask for feedback. You’re not the only player! Talk to the other players about their characters. Look for ways to support them in-game, not just statistically, but also by backing them up when their characters suggest courses of action, and proposing in-game things their characters can do (with your character’s help). The game’s a lot more fun when player-characters are working together towards their goals. That said, your players are also figuring out their characters in play. Watch for unexpected moments of character development during the game, and do your best to support them. Action: Ask each other player what you can do to help their character achieve his or her goals. Write these down and have them with you during the game. 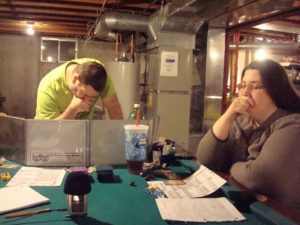 Many gamers consider improv the Holy Grail of effective, in-character role-playing. While improv doesn’t map precisely onto tabletop role-playing, learning and practicing improv will certainly improve your role-playing skills. Look up articles and books on improv (one of the best is Impro: Improvisation and the Theatre by Keith Johnstone). Look for ways to integrate that into your play. There are two main exceptions to this rule. First, if someone introduces a fact that contradicts already established history, step back out of character and ask the player to clarify. Second, if someone tries to act for another player in the moment (such as “Your character attacks me”), step out of character, point out that the other player doesn’t get to choose your character’s current actions, then move on. If you don’t like what another player introduces, you can use “Yes, but…” to describe a complication to the fact. This is a way to take a problematic situation and turn it to your favor. Just don’t do it often. Action: When a player introduces a new fact, accept it and add to it. If you’re actively doing things in the game, it’s easy for your character to become central and overshadow other characters. You can turn a group story, like The Avengers or Guardians of the Galaxy, into a solo-hero story like Indiana Jones. Some players are okay with that, but many aren’t. Fortunately, this is relatively easy to fix: choose actions that include other characters. Invite another character to help you with your intended action. Don’t just wade into battle; ask another character to cover you. Also, spend a session where you take a back seat. Let other players push the story forward. Certainly act and react, but if you’re consistently the one acting first, try being more passive and see what happens. Action: Choose courses of action that include other player-characters. That’s it! Stay tuned for some troubleshooting tips tomorrow.